Is your crooning lacking it’s luster? It could be you’re singing from your throat vs your diaphragm. Today, I want you to look over these 3 breathing techniques and diaphragm singing exercises to help correct this before your next performance. How to really breathe deeply for effect. You do warm up exercises, run through the music scales. And, as a singer you are well aware of your vocal condition, weather, etc. But, did you know that your diaphragm can affect your singing voice quality as well? Learn How to Sing Better Now .. This set of singing lessons cover the art (and science) of how your diaphragm affects your voice. If your singing were done by computer, you could click the mouse and correct the sounds and volume. However, you do not have a digital voice, just a human singing voice. So, you need to control it from within. These three tips will help you achieve that goal. Ever Heard of Diaphragm Singing? If you’ve been singing any length of time, you have probably heard the phrase “sing with your diaphragm”, right? But, what does this really mean? What is the diaphragm, and how does it work? And, how does the diaphragm help with singing? This is basically a system of muscles, connected to the lowest ribs on the sides. It is also connected to the sternum and the back, top lumbar region. The diaphragm’s primary function is to help you inhale. It descends when you inhale, displacing the viscera, upper intestines and stomach. People with a short waist will notice that their epigastric area, or the area between the naval and sternum, bulges out when they inhale. Long-waisted people will show little bulging while inhaling because there’s more room for expansion. Okay, that’s WAY to technical for me – Let’s get simple! The diaphragm plays no role in actual exhalation. But, it does act as a controlling muscle system, and controls how quickly you can exhale your breath. Actually, the abdominal system controls exhalation, which is located from your naval to your pelvis. When you exhale quickly, the diaphragm remains basically inactive. However, when exhaling slowly, it resists the natural exhaling action of the abdomen. **EXPERIMENT: Try breathing out very slowly and you’ll notice that for the first second or two, you are controlling the exhalation. After that it happens without effort. Your diaphragm has taken action to ensure proper exhalation. Amazing, huh? When you breathe out quickly, you control the exhalation process. Try it both ways to feel the difference. When singing, it’s like you are breathing out these long, slow breaths throughout your song. You can try to control them. But, on long notes, the diaphragm will have to take over. It’s only natural! Every person has a strong diaphragm – no matter what their size or height. It just doesn’t need to be strengthened. It needs to be controlled. And, to control your diaphragm, you must learn how it’s done. Your vocal cords should not be used to hold back excessive pressure from breathing. Instead, they should only have enough breath pressure to help maintain their sound vibrations. If too much pressure falls on the vocal cords, they press together tightly, and cannot freely function as they should. While singing, your epigastric area should not be sucked in. Instead, it should remain in the same position, after the onset of a vocal tone. This sounds like the opposite of what it should be, right? Think about it. If you take a good breath, and then exhale most of it before singing the note, you’re going to be “out of breath” too quickly. This happens because your diaphragm has already collapsed. So, inhale a deep breath. Then, be sure to breathe in properly with your gut extending outward slightly, not your chest. Next, sing and allow the diaphragm to go to work. Imagine a whirlwind coming up from your stomach, And then, aim for the area between the soft and hard palate to control sound. 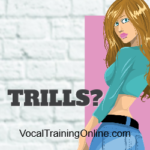 Using this vocal warmup method, notice you can hold the notes or sing longer phrases, without breathing difficulties. Remember, continue with other lessons for improving singing voice. Yes, breathing techniques for vocals will help take care of the diaphragm issues. But, don’t stop here. Develop your musical talent and take it to the next level. Get excited as a singer. Learn daily. And, you’ll see a real difference when you perform on stage for thousands or even at your local karaoke competition. 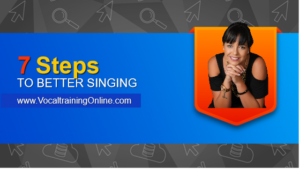 The Best Singing Tutorial Online? 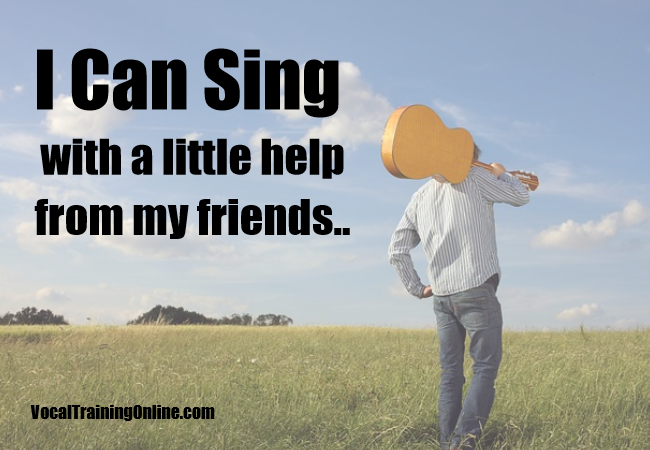 If you don’t feel you are ready to sing using your diaphragm yet, you can find plenty of tutorials about singing online. One course I like is Singorama. 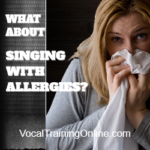 If you feel uncomfortable singing in front of a group of people, voice training might be just what you need to overcome your singing fears! I hope you enjoyed this tutorial with diaphragm singing tips. I also hope you will take your training seriously to become that vocalist you’ve always wanted to be. 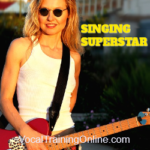 If you’re really serious about singing, check out my free newsletter & gift below ..